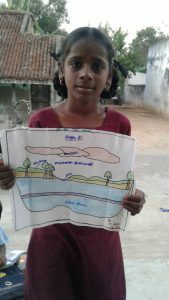 Kamatchi and her family live in Udayarkuppam Village. Her two sisters are mentally handicapped and her mother was the sole breadwinner for the family. Following an accident, She was no longer able to work and support them. The family were left in desperate poverty without enough money for food. Kamatchi saw that the only way she could help her family was to continue her education and get a degree and a well payed job. Her ambition was to become a teacher but with no money to go to college or even feed her family, her situation looked hopeless. 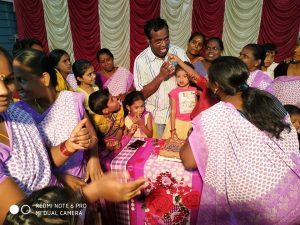 Nandri heard of the family’s plight and with their help the poverty stricken family were rehoused to provide suitable accommodation for their special need children. 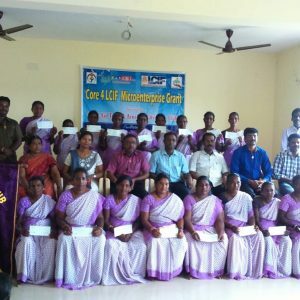 Nandri also organised the finance for Kamatchi’s college course. She is well on her way to becoming an excellent teacher and is so grateful for the help that Nandri has given her and her family. They now have hope for a bright future thanks to Nandri and the generosity of our donors. Jansi Rani, from Thalaiyampallam, is one of the Nandri Children we have supported throughoutmsecondary school. She was an excellent and ambitious student and was determined to break the cycle of poverty for her family by getting a good education and a well paid career. Jansi’s mother is a widow and was struggling to feed and support her 5 children. Two of the children have serious medical problems, which put a further financial strain on the family. Nandri gave Jansi a loan so she could complete her 3rd level education and become a nurse. It was a day of tremendous celebration for her family and the village when Jonsi graduated. She is presently working in a Delhi Hospital and is able to send money home to her mother and siblings. Nandri gave Jonsi a secure future and and as a result, a better life for all her family. Thanks to the support of our kind donors, Nandri is able to change people’s lives for ever. Leena Therese comes from a poor family in the rural village of Elayankanni. Leena, a bright and hard working student, always achieved top marks in her exams. After completing secondary school, she enrolled in a college to study for a Medical Electronic Engineering degree. She managed despite financial difficulties, to successfully complete two years. She was heartbroken when due to her Dad becoming very ill, she had to leave college to help support her poverty stricken family. Leenas career looked like an impossible dream. Nandri heard of Leenas plight and agreed to pay the next two years of college fees which will enable her to graduate and fulfill her ambition to become a successful Electronic Engineer. With the help of Nandri and the generosity of our donors, Leena Therese will have a secure and successful future and be able to support her family. Over the last number of years, Nandri has granted a total of 518 ‘Support Higher Education’ loans to children, so they can continue their education to 3rd level. In 2018, 179 children were given life changing financial loans so they could stay in education and achieve a degree leading to a rewarding career. This enables the graduates to support themselves and their families. Nandri recognizes the importance of early education and supporting our very young children. 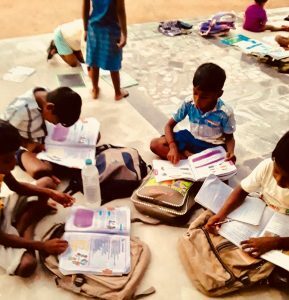 As well as encouraging and enabling our older children to progress to higher education, we also run after school children’s clubs for the younger Dalit boys and girls. To date we have 10 Child resource Centers catering to the needs of our children. When their school day ends they go to the after school clubs. They kick off with some fun traditional games to energize the children before starting their homework. Many of their parents are illiterate and so unable to help their children with completing their homework assignments. One of the many benefits of our children’s clubs is our remedial teachers are always on hand to help them. WIth the wonderful educational support these young boys and girls are receiving from Nandri, we expect to see tremendous success with our children continuing on to 3rd level education and well paid, fulfilling careers. This was something impossible for a child from an untouchable Dalit family until Nandri, with your help changed everything and gave them a bright future. Without the support and donations from all of Nandri’s supporters we could not change these young peoples lives, giving them not just hope, but the practical financial help they need to achieve their goals in life. On behalf of all our children, I would like to say a big thank you! 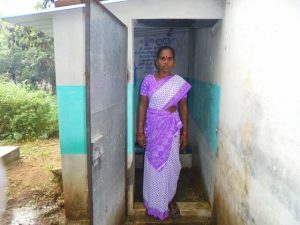 To date, our sanitation programme has provided a total of 58 families with new toilets for their homes. The toilets are a very basic outdoor construction. The Indian government will provide 50 per cent towards the cost of building but without a loan from Nandri the families would be unable to afford the balance. It is normal in poor areas of rural India for families to defecate in the fields beside their homes. 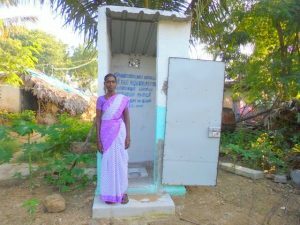 The loans from Nandri to help build toilets has changed the lives of these impoverished people and given them the opportunity to live cleaner and therefore healthier, more dignified lives. We are continuing to educate our mothers and children about the importance of hygiene to prevent diseases, teaching them to wash their hands frequently to prevent the spread of germs. The children are bringing the lessons they are learning in our Resource Centers home and sharing good hygiene practices amongst the rest of their families! Nandri would like to say a big thank you to our supporters of this project. You are helping us transform the quality of these families lives forever. Christmas should be a season of happiness and joy but for our poor Dalit mothers, struggling to survive, this is not the case. This year, we wanted to make Christmas extra special for them. 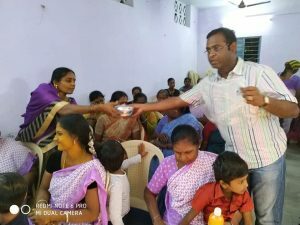 In previous years we gave our mothers sarees but this year our group leaders suggested we give small gifts to celebrate Christmas and recognise our mothers achievements in the past year. It certainly lifted their spirits! They sang and danced and were delighted with the presents they received. The spirit of Christmas and the joy of giving brought happiness to all during our celebrations. It’s our business to make Nandri work! In Nandri, we believe that it is very important for our Donors to understand how our charity works, how it benefits our families and where their money is being utilised. The tightly organised day to day running of our charity is key to its success. The CEO of our partner organisation in India once said to me “Fred this is not a business it’s a charity”. I answered that unless we run it like a business with professional procedures and systems then it will not prosper. We implemented Salesforce, one of the best corporate CRM systems in the world, and a number of user licenses were made available to us free of charge by the company. We are extremely grateful to Salesforce. It has enabled us to manage the records we have on thousands of our Nandri mothers in our non profit. 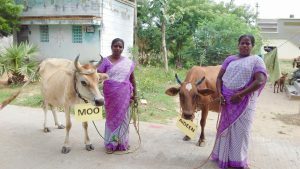 In January 2012 we started a micro finance programme to give a loan to a mother to buy a cow or other income generating asset. The mother can repay a loan within two years and all repayments are immediately re-loaned to another needy mother in the group. In 2013 we realised that many of our children were dropping out of education at 17 or 18 years of age. We then started to give them loans to go to college. This immediately doubled the number of our children who go to 3rd level, as many families could not previously afford the upfront fees, despite the fact that this was only in many cases less than €100 per annum. Most of our mothers only earn €20 a month. Every month almost Rs.2 million is processed through the Salesforce system. Within two weeks of each month end we receive a set of management accounts which have been audited by a local chartered accountant in India. In Ireland one of our directors who is also a chartered accountant produces monthly accounts for Ireland and reviews the accounts from India. Our mother’s pay 1% per month interest on the reducing balance and this is mainly used to fund the third level loan program. Our mothers also pay a membership fee of about one rupee per day. This income is enabling us to grow the organisation and to achieve a level of self sustainability in India. In February 2016 we opened our Nandri centre. It is a 6000 ft.² building. The opening was attended by over 3500 mothers and children and local dignitaries. It has put us on the map locally and has enabled us to apply for grants from the Indian government to run training programmes for our mothers and children. It cost about €300,000 and was fully paid for by a small number of donors from Ireland including some directors. The building is used for training courses and administration and for regular meetings of over 600 officers of our 200 mothers self-help groups. Most of our 3500 mothers are members of the low caste so-called untouchable Dalit community. We found it difficult to rent rooms for meetings and offices. Our mothers are treated like travellers in Ireland, who find it hard to rent rooms for weddings or other celebrations. Our 3500 mothers proudly wear their Nandri saris and are proud to be part of our organisation. We are a small organisation and our revenue for the current financial year is likely to be around €200,000. We only have one part time employee in Ireland who works 10 hours a week. Our future strategy is to grow our micro finance fund. Since 2012 we have issued loans of over €900,000. The repayments are used to issue about 50 to 100 new loans every month. In 2016 we were approved a grant of $50,000 from the Lions Clubs International Foundation #LCIF. We had to come up with $17,000 matching funds and much of this was provided by Lions Clubs in Ireland. This fund has already being used to provide loans to 350 widows and single parents. On top of our micro finance programmes, our mothers, who meet every month in groups of 15 to 20, are also encouraged to save. They save about Rs.100 per month which is the equivalent of a days wages for them. This money is reloaned to their group colleagues. They also charge each other a small interest-rate. Our mothers proudly show off their passbooks which record their subscriptions, savings and loans. We have set up the necessary paperwork systems to enable them to manage these loans and savings themselves. We employ eight fieldworkers who attend all the meetings to ensure that all our procedures and systems are maintained. We want our sponsors and donors to know that we make their money go far. 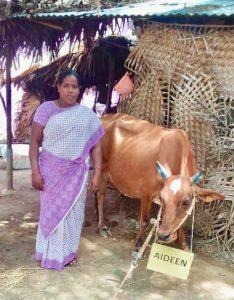 Every €400 donation will change the life of a family who receive a loan to buy a cow. Two years later the same money will benefit another family and so on. A donation to Nandri is a gift that keeps on giving. Our future plan is double the size of our loan book. Within five years we hope to have 10,000 mothers of which over 5000 will have received a life changing loan. centres after school and start their evenings with some traditional fun games in order to relax after their long days of learning at school. Their evening studies are supervised by the teachers, who help them with their homework, practice reading and writing skills, and also organise singing and dancing classes which the children thoroughly enjoy! was privileged to visit one of these centres in January, and enjoyed seeing their school work and a wonderful display of singing and dancing from the most happy, smiling little people. It was a joy to see. 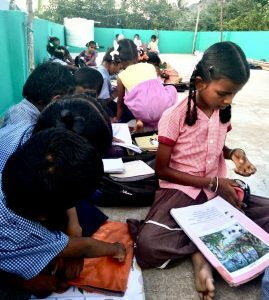 Nandri Resource Centres are helping the future generations of Nandri families fulfill their dreams and escape poverty through education. 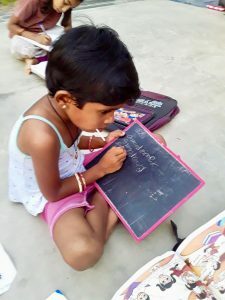 The Nandri Foundation is committed to the education and development of our children. All our activities are carefully designed to protect and promote the best interests of the child. An important part of that is insuring that our young people learn how to play together and have fun! 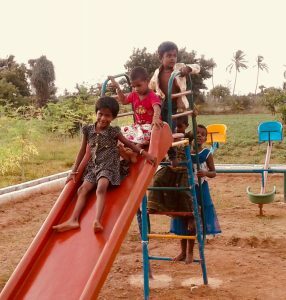 In the Nandri Centre, we have set up a playground for the children with lots of equipment that they can enjoy after they spend time in educational classes. Towards the end of their day, the children are so excited to go outside and the sound of their laughter fills the air! It gives them a chance to forget their difficult empoverished lives and just be children having fun with their friends. After a recent training programme for local children, you could feel the excitement in the air as the day came to an end and they could finally run to the playground! In the words of Jerald, our Chief Operating Officer “The children forget everything and they are in their own world. The campus is filled with laughter, joy and happiness”. 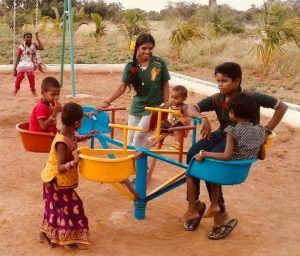 When the evening came to a close, the children were sad to tear themselves away from the playground and leave – but the Nandri centre will always be a place that our young people will remember with love, a place of positivity, education and fun and they will long to return time and time again.